Artis Amsterdam Royal Zoo (also known as: Natura Artis Magistra) was founded on 1 may 1838 by Gerardus Frederick Westerman, JWH Wai Linn and JJ Wijsmuller. The purpose of Artis was to love and care for nature. The zoo has over 20 monumental buildings. In the past years the park also renovated a lot. Artis owns about 900 animal species. Some of them are very rare, for example, the almost extinct algazellen. 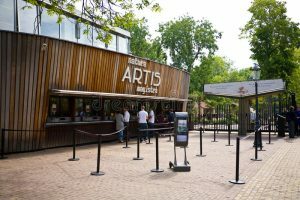 Also other rare species such as the sykes monkey and the hamlyn’s monkey can be found in Artis. The zoo has many sights for people to visit, this zoo offers more then any other zoo. For the bug lovers there is a beautiful butterfly garden, for the astronomy lovers a planetarium, and fish lovers a aquarium. Artis includes 27 historic buildings. The Aquarium was built in 1882 on land leased from the city on condition that only a museum ever be built on it. The library dates back to 1867 and the building the ‘Ledenlokalen’ on the right side of the main entrance dates back to the 19th century as well. If you want to save some money, you could always Google for “Artis Korting” to see some discounts for the zoo. For visiting the center of Amsterdam and the larger Region of Amsterdam you could buy the Amsterdam & Region Travel Ticket for 1-2-3 days. A very handy ticket for visting place like the Zaanse Schans. Only going travel inside the city of amsterdam? Then a normal Amsterdam Travel Ticket is a better choice. Also available for 1-2-3 days.